Yes, it's still great. 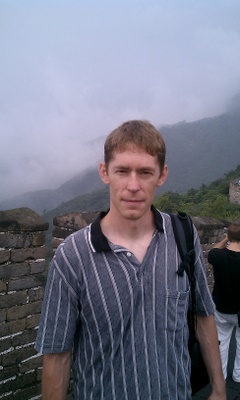 . .
BLCU arranged a trip for us to go to the Great Wall. The wall is something that everyone who comes to China should see, but having seen it previously, I was not sure I wanted to go back. However, I did want to meet my new classmates, since we hadn’t had the opportunity to talk much yet. I’m glad I ended up going because it turned out to be a fun trip. On the way up, I sat by Lee. Lee is a 53 year-old Korean man who is taking a month off from his business to come study Chinese. Twenty years ago, he founded a wall covering import business that was doing well until about 2 years ago. His company does business in seven countries. Interestingly enough, the company imports some of its wallpaper from New Hampshire. Apparently America does still export some manufactured goods. We arrived at the wall at about 10am along with many other tour buses. After we got off the bus, to get to the park entrance we had to run a gauntlet of hawkers pushing everything from fruit and nuts to t-shirts to just about any type of China souvenir you could imagine. The weather was humid but overcast, so it didn’t get too hot. We spent two hours making our way up and down the massive stone structure, taking care to not trip on loose or uneven stones. It might have rained the night before because the stones were damp and slick in places. The wall itself is an immense stone structure that snakes over ridge tops and rolls across valleys for as far as you can see. The dense gray-brown stone appeared to be uniform throughout the section we visited (Mutianyu). On either side of the wall there was a dense, lush cover of dark green bushes and small leafy trees. The hills where the wall was built are steep like the Cascade mountains, and its designers decided that the wall would be most effective if it were built over the most inaccessible places possible. I am not qualified to say whether the wall itself is an engineering marvel, but the actual construction itself is an great demonstration of human persistence. Every tourist who goes up the wall must come down. At Mutianyu, adventurous travelers can take a slide down from the top of the wall instead of walking down a long staircase or taking a chairlift. The slide itself is a cross between a luge track and a type of children’s slide that you can still find at many city parks. The track is made of stainless steel and to ride down it you sit on a plastic sled with nylon runners underneath. To control your speed, there is a brake with a handle that sticks up between your legs. You push forward to release the brake to go faster, and pull back to slow down. If you don’t use the brakes too much, the sleds can reach 40mph. At this speed, it’s possible to get thrown off the track on a curve, so there is an element of danger that makes the slide fun. Unfortunately, not everyone felt the same way. Since visiting Changsha in 2005, these slides have been something I look forward to riding each time I go to China. In Changsha, Gerlitz, Ryan and I rode a big slide twice because it was so much fun. In 2009, with the MIM program, a group of us rode the slide down and unfortunately I got stuck behind someone who didn’t like speed. In 2010, history repeated itself. A group of six students (Lee and I had fallen in with a group of Spaniards who were also studying at BLCU) bought our tickets for the slide and headed to the loading area. There was one middle-aged couple, from France, waiting in front of us. We had to wait for a few minutes while the attendant on duty collected the sleds that were being sent back up on the chairlift. Once he had finished, he sent the French couple down, and then our group got on the sleds one after another. Remember I said that not everyone is adventurous about speed? Well, the French woman was clearly not feeling too adventurous. Her husband, tellingly, went down in front of her. I know why. He didn’t want to get stuck behind her. He left that to us. . . Mercí!!!!! If I knew any French epithets, I would insert them here. Now, I understand that some people are more cautious than others, and I realize that we were a group of adventurous young people (Lee included) out to live life, so maybe I should be more understanding. But if you don’t want to go fast, GET THE HELL OUT OF THE WAY! You can get on the chairlift at the same spot, and if heights scare you, the staircase is to your left. Use them. By the time we got down to the bottom, all six of us were bunched up in a line behind the woman. I think I could hear Luis, who was right behind her, cursing at her in Spanish. It was frustrating, to say the least, but we couldn’t really do anything. My slide actually came to a stop several times where the track flattened out, so I had to grab the side of the track and repeatedly pull myself forward. After such an invigorating (infuriating, rather) trip down the mountain, we went to “take” (“drink,” in Spanglish) something while we waited for the bus. To my surprise there was a Subway attached to the drink shop, and I can confidently report to you that the Subway at the Great Wall of China smelled as bad as the Subway in San Francisco and the Subway in Portland. At least they’re consistent. Despite my recent bad luck on the slide, if given another opportunity to go to the Great Wall, I will probably take it if I’m with a group of first-timers. Some of the novelty has worn off for me, but there’s plenty to see. After all, it is still a great wall.